Look for the yellow house with the wht picket fence only steps from downtown Birmingham. Open floor plan w/hardwood floors t/o. Living Rm w/fireplace opens to custom kitchen, spacious eating area & built-ins, ideal for homework. Master suite shares 2-way fireplace w/luxury bath. All bedrooms have walk-in closets. Convenient 2nd floor laundry. 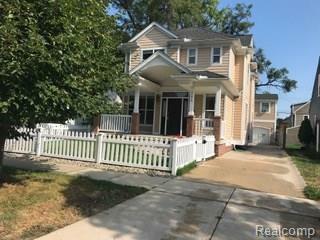 Additional living space in finished basement w/full bath & egress window. BONUS living area w/full bath above garage, ideal for in-laws, guests, office or workout room. Electric gated driveway allows access to private professionally landscaped yard, perfect for entertaining. Garage wired for electric vehicle charger. Top rated Birmingham schools. Agent owned. Licensed MI Agent must be present at all showings. Listing provided courtesy of Real Living Great Lakes Re-Wb.